In 1931, Heinkel recruited the talented aircraft designers,Walter and Siegfried Günter, and their first major design for Heinkel was the Heinkel He 49. While this was officially an advancedtrainer, in fact it was a fighter. The firstprototype, the He 49a, flew in November 1932, and was followed by two further prototypes, the He 49b, with a longerfuselage, and the He 49c, with a revised engine. The type was ordered into production for the still secret Luftwaffe as the He 51, the first pre-production aircraft flying in May 1933. Deliveries started in July of the next year. The He 51 was a conventional single-bay biplane, with all-metal construction and fabric covering. It was powered by aglycol-cooled BMW VI engine, with an armament of two 7.92 mm (.312 in)machine guns mounted above the engine. The He 51 was intended to replace the earlierArado Ar 65, but served side-by-side with the slightly laterAr 68. The He 51 was outdated the day it entered service, and after an initial run of 150 production fighters, the design was switched into the modified He 51B, with approximately 450 built, including about 46 He 51B-2 floatplanes, and then finally a further 100 He 51C light ground-attack plane. On 6 August 1936, six of the He 51s were delivered toSpain to fight in theSpanish Civil War. Initial operations were successful, with the Heinkels meeting and defeating a number of older biplane designs, with twoNieuport Ni-52 fighters, aBreguet 19 and aPotez 54 destroyed on 18 August 1936, the first day of operations by Spanish-flown He 51s. Deliveries continued as the hostilities increased, with two Nationalist squadrons equipped by November, and theLegion Kondor forming three squadrons of 12 aircraft each manned by German "volunteers". This time of superiority was short lived, with the arrival of large numbers of modern aircraft from theSoviet Union, including thePolikarpov I-15 biplane and new Polikarpov I-16 monoplane, together with theTupolev SB bomber, which was 110 km/h (70 mph) faster. The He 51 proved unable to protect the Legion Kondor's bombers, forcing it to switch to night operations, while also unable to intercept the much faster SB. 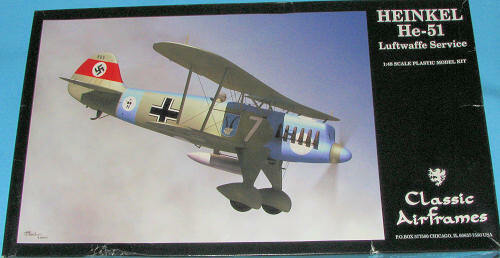 The He 51 was therefore withdrawn from fighter duty and relegated to the ground-attack role by both the Legion Kondor and the Spanish Nationalists, It was replaced in the fighter role by the Fiat CR.32 in the Nationalist Air Force, with the Legion Kondor receiving Messerschmitt Bf 109s from April 1937 to allow it to operate successfully in fighter operations. While a failure as a fighter, the Heinkel proved successful as a ground-attack aircraft, being used by Wolfram von Richthofen to develop the close support tactics which were used by the Luftwaffe in World War II. It continued in use as a ground attack aircraft for the remainder of the Civil War, although losses were heavy. After the war the 46 surviving aircraft would be joined by another 15 new builds, and serve in the utility role in Spain until 1952. The experiences in Spain would prove once and for all that the days of the biplane fighter were over. Although the later model Fiat biplanes were superior to the He 51 and continued to soldier on in Nationalist service, the I-16s were basically untouchable because of their speed. If the conditions were right, they could use their heavy armament in a quick pass and then leave; if things weren't so favorable, they simply flew away. The lesson learned by all of the participants was that speed was far more important in combat than maneuverability. The He 51 continued in front-line service with the Luftwaffe until 1938, with it remaining in service as an advanced trainer for the first few years of World War II. This was Classic Airframes second molding of the He-51 and one of their last kits before the company disappeared. While it is still a short run kit, it is completely different from the original boxing. Gone is the photo etch and the acetate parts, while much of what was in resin is now in styrene. One still have to deal with the ejector towers in many of the larger parts. Those inside the wheel spats will be particularly difficult to deal with as they are right next to the little axle stubs that hold the main wheels. Resin is limited to the main wheels, seat and two small controls for the cockpit. There is also a clear plastic windscreen which on my kit was broken away from the sprue and has disappeared. The cockpit is nicely detailed and one gets a framework section for the sidewalls. The one piece wings will need the strut location holes drilled out more as one gets just dimples with which to work. Separate ailerons are provided for the upper wings and there is a separate rudder as well. Oddly, the elevators are molded in place. We still get 12 separate exhaust with this one and any detailin g to them will need to be added with sprue or wire. A separate fuel tank is included for under the fuselage. Instructions are well done with smaller detail drawings where needed. There is also a full rigging diagram. This one is somewhat complex compared to other biplanes of its time. On a separate set of drawings are the color and markings information. There are markings for four aircraft. First is an overall 'light grey' aircraft with civil code markings as typical for 1934. Next is a 2./JG 137 plane in green trim from 1938, A Brown trimmed II./JG 134 plane is next followed by the box art plane in blue trim from 3.JG 135 in 1938. 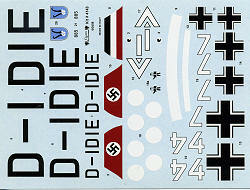 Each of the last three have white bits in their trim markings and those are provided on the very nicely printed decal sheet. The main colors and bands, however, will need to be painted by the builder. Those who have built the early He-51 will probably find this one to be a much nicer kit in all respects. 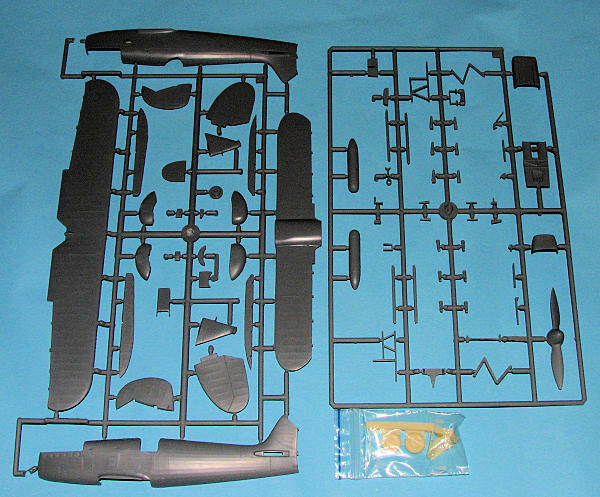 Thanks to the liquidation of Classic Airframes, it is possible to find these kits at bargain prices if one looks around.